Please read this KB Article completely, especially if you got this warning message while sending out funds from Exodus. Warning! The address is not formatted properly. Please double-check each character in the address. If you send to a wrong address, your funds cannot be recovered! You are seeing this message while sending Ethereum (ETH) or any ERC20 asset out of Exodus is because the address you have scanned or entered in the send field is a bad address. Ignoring this can lead to loss of funds. 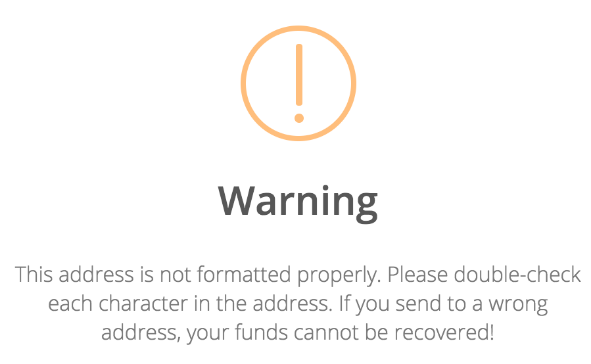 You must manually verify each character of the address you are sending to if you get this message - ignoring even a single character can lead to loss of funds. Exodus cannot recover funds if you send them to the wrong address. Just manually triple-check the address before you hit send. Or better yet, copy-paste the address from the source instead of using a QR Code scan. I am interested in learning the technical details of this sorcery! Ethereum addresses have a mixture of upper and lower case letters, and they are case sensitive! For example, here is a valid receive address for ETH: 0x507877C2E26f1387432D067D2DaAfa7d0420d90a. If you were to alter one of the letters in the middle, 0x507877C2E26f1387432E067D2DaAfa7d0420d90a ('E067' instead of 'D067'), Exodus will catch this and show you the above warning. The reason is that we internally run what's called a "checksum" on the address itself to verify the internal integrity of the address. Exodus will warn you since it determines that the address is invalid or incorrect. However, if you were to change the case of the address, for example, like so: 0x507877c2e26f1387432d067d2daafa7d0420d90a (all lower case letters), it would technically still be the same address. However, the checksumming is completely defeated and there is no way Exodus can tell if the address is good or not. The above address will work; however, this address, 0x507877c2e26f1387432e067d2daafa7d0420d90a (altered so that the 'd067' is now 'e067'), would only appear to work. Exodus used to allow the altered, lowercase address to go through, but your funds would go nowhere and be lost forever. What Exodus now has is the ability to test the address and make sure it is "mixed case." This allows you, the user, to be certain the address is being checked for correctness and will prevent you from accidentally sending funds to a malformed address and losing them forever! We have had a few users lose money by scanning QR codes (from Jaxx and Binance in particular) that are invalid due to bad image quality or no checksum on QR codes, so we want to prevent this from happening in our wallet. If you get this message, it is because the address is malformed and should not be triple-checked before using. Check with the wallet maker which generated the address and ask them for quality control to ensure their addresses are mixed case and "checksumable". This also applies to all ERC-20 tokens as well, such as Aragon (ANT), Golem (GNT), Augur (REP), EOS, District0X (DNT), etc.